During the last bloggers' gathering, we discuss about this 相思蛋糕 (or known as Ogura cake). Then Rei started baking this, and shared some with me. It was so good I had a few slices at one go! The cake was really light and airy. I also saw many Malaysian and Singapore bakers attempted this cake and they looked really good. You can read more background of this cake from Corner Cafe. If you do a search, you can actually find many recipes now. Finally, I decided to try this cake since I wanted to use up my eggs. I adapted the recipe from Honey Bee Sweets. After baking, then I saw Sonia's post on her experiences on this "touchy" cake. I'll share my notes below. 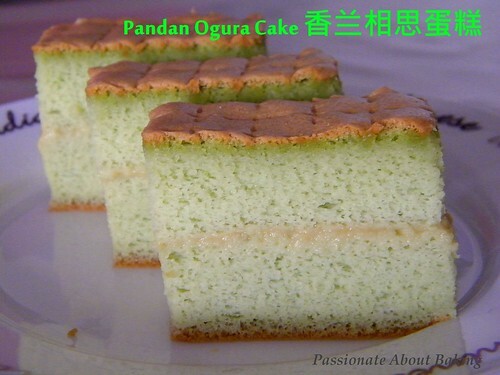 Recipe for Pandan Ogura Cake (香兰相思蛋糕), adapted from Honey Bee Sweets. In a large mixing bowl, beat the egg yolks, whole egg, oil, salt, coconut pandan milk mixture together till well combined. Line a 8"x8" square cake pan. In a mixer bowl, add in the egg white and beat till foamy. Gradually add in the sugar mixed with the corn flour and continue beating till almost stiff peaks. Gently fold in the egg white mixture into the egg yolk mixture in 3 separate portions. Pour the batter into the prepared cake pan and bake in the preheated oven of 160C for 1 hour in water bath. Remove from the oven and let it cool on a rack upside down for 15 mins. Remove the cake from the pan and continue to let it cool. I used a 7"x7" cake pan and the batter was already close to the rim. Probably because I used 7 eggs, which weigh about 220g egg whites. I had overbeaten the egg whites and found it difficult to fold into the liquid mixture. In doing so, I could have deflated the whites, which explained why the holes in the cake was not uniform. I let the cake cooled in the pan. After removing the pan, it caused a dent on the bottom. I would consider this cake not very successful for me since I didn't get the correct texture due to my egg whites. After taken Rei's cake, I already had a "baselined" of how and what it should be. 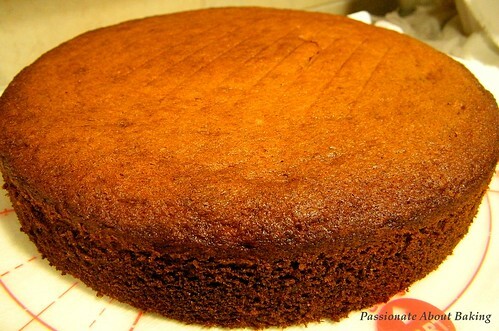 Nevertheless, this recipe is still good and the cake was really soft and light. You can refer to Sonia's thorough write up on this cake. I will probably use hers for other flavours the next round. 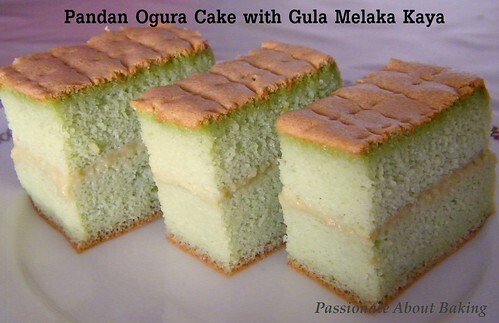 I sandwiched my Pandan Ogura Cake with homemade gula melaka kaya. I adapted this recipe from Kitchen Tigress. 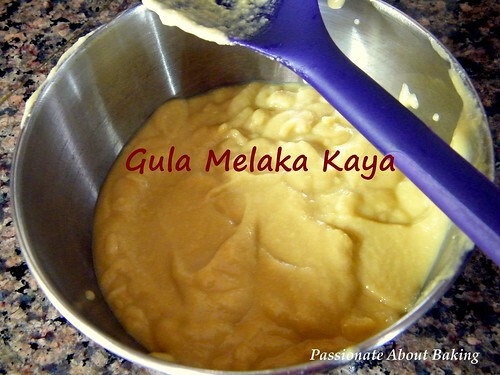 Recipe for Gula Melaka Kaya (Palm Sugar Coconut Egg Jam), adapted from Kitchen Tigress. Cook gula melaka, sugar and coconut cream in a pot over medium heat. Bring it to a gentle simmer. Slowly stir half of the coconut mixture into the egg yolks. Mix well. Pour the egg mixture back into the remaining coconut mixture in the pot. Reduce the heat to low and stir till the mixture coats a spoon thickly. Discard the pandan leaves if using. Let it cool completely before bottling, then refrigerate. Use it to spread on your Ogura cake. Enjoy! The coconut jam was a lumpy after it cooled down. I sieved it to get a smooth texture. 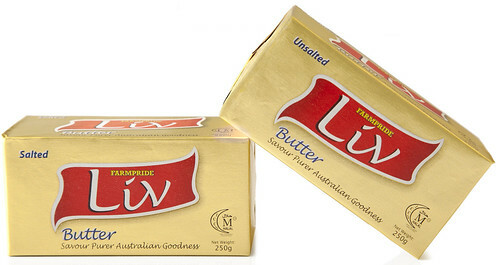 This post is sponsored by LIV butter. 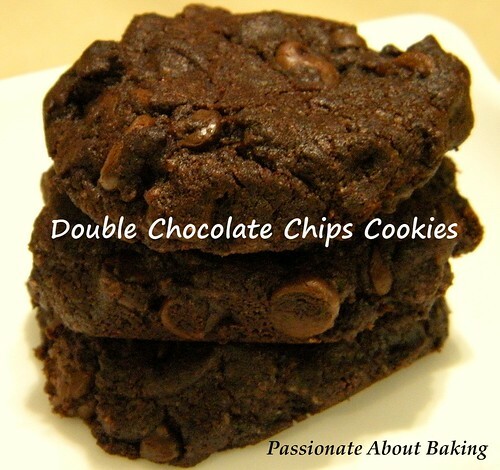 Requested from my children again after I made these rich Double Chocolate Chips Cookies for their teachers. Preheat oven to 170C. Line baking trays with baking papers. In a large mixing bowl, beat the butter with sugar until light and fluffy. Add in eggs, one by one, followed by vanilla extract and beat until incorporated. Add in the sifted flour, cocoa powder, baking powder and salt in two batches. Mix till just incorporated. 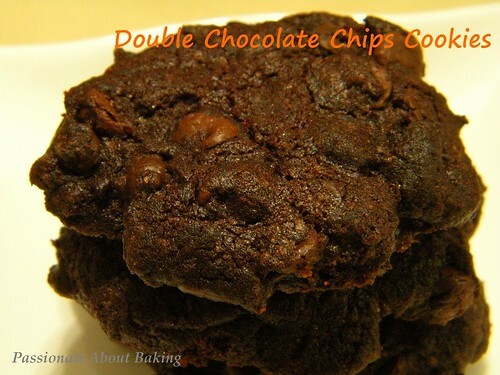 Fold in the chocolate chips thoroughly. Using a small ice cream scoop, place the batter on the prepared trays, spacing about 3cm apart. Gently use your fingers to flatten the cookies slightly. Bake for approximately 18-20 mins, or until the cookies are still soft in the centre but firm around the edges. Remove from the oven and let the cookies cool on the baking sheet for about 5 mins before removing them to a wire rack to cool completely. 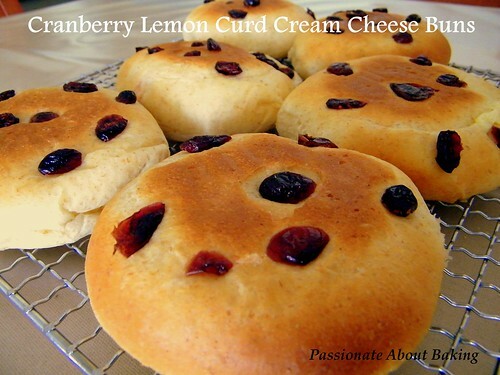 After many hesitated moments, I finally got down to making the barcook-alike Cranberry Cheese Buns. However, I decided to add my lemon curd to the cream cheese. The addition of lemon curd made it difficult to wrap the dough as it was soft. However, it produced a really tarty and smooth cream cheese filling and was very nice. The cream cheese didn't curdle after baking and remained smooth. I really like it. My family members also loved them! Mix water roux ingredients together in a bowl. Cover bowl with cling wrap and store in fridge overnight. In a mixer fitted with a dough hook, add all the ingredients except butter and water roux. Start mixing at slow speed. Then increase to medium speed and continue kneading until dough lifts from the wall of the mixing bowl. Add the water roux and continue to knead for 3 mins at low speed. Add butter and increasing kneading speed to medium. Continue kneading for 15 mins on medium speed until dough is no longer sticky and does not break when pulled to perform window test. Cover with cling wrap and leave to proof in a warm area for 45mins. With lightly floured hands and table top, knead (6) to form a smooth round ball. 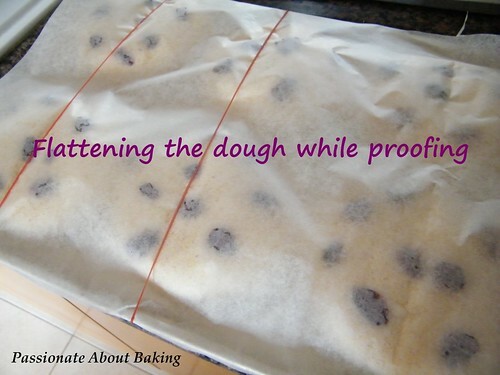 Roll each dough into a round ball and leave to proof for 10mins. Flatten each ball and roll out to a circle with a rolling pin. Scoop half a tablespoon of the cream cheese filling into the dough and very carefully seal the edges of the dough to form a ball. Then flatten each of them. Randomly placed cranberries on the doughs. 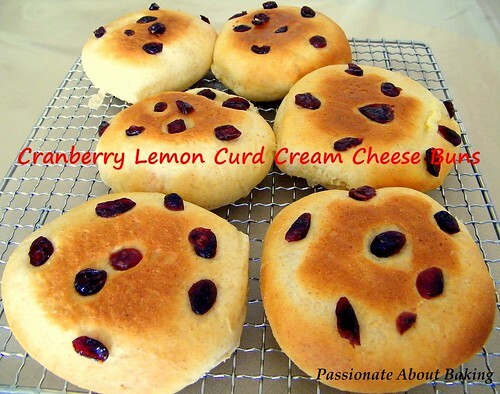 (for the remining doughs, I made into cheese & sugar buns). With the baking paper on the dough, placed another baking tray on top of the proved dough. Bake it in the preheated oven at 190 for 18mins or until browned. Cream the cream cheese with icing sugar until smooth. Add lemon curd. Mix well. Over ripen bananas? Fret it. 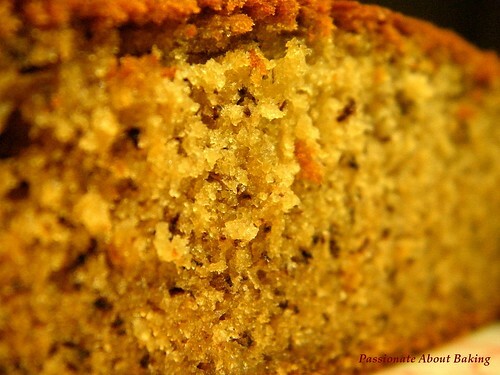 Bake it with LIV butter, and you'll get a really fragrant banana cake. Result? Very soft buttery banana slice! 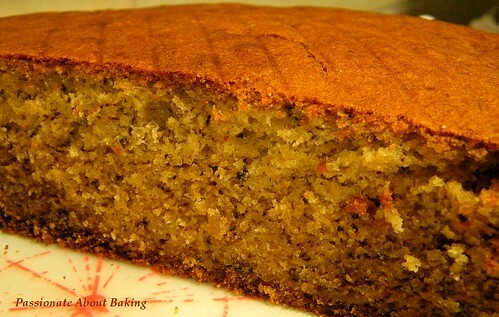 Recipe for Banana Cake, modified from Prima. Cream butter and sugar at medium speed till light and fluffy. Add eggs one at a time and mix till batter is smooth and creamy. Stir in the mashed bananas into the milk. Fold in the banana mixture into the butter mixture. Sift in the flour and baking soda and gently fold them in. Pour the batter into a lined round 9" baking tin. Bake at preheat oven of 170C for approximately 65mins, or a skewer inserted comes out clean.